Searching for a Certified Home Appraisal in Four Corners, TX? As one of the leading providers of residential and commercial appraiser services in the Four Corners market area, our certified appraisers can help you with valuations for both private and lending use. We aim to deliver an appraisal service that meets our clients expectations and is delivered with an industry leading turn time. Not only do we complete our reports faster than most other appraisal companies, we advertise some of the lowest costs for appraisal services in the area. Our staff of appraisers are all local to the Houston area and are competent in appraising for various property types for any purposes including residential, commercial and mixed-use properties. If you have a commercial property assignment, most our Texas Certified General appraisers hold the MAI designation from the Appraisal Institute and are available across a large portion of South East Texas. We take pride in providing real estate appraisal services for any need including lending, private use, insurance and legal matters. Be it homeowners or industry professionals, our dedication to you remains the same – to provide a reliable and courteous appraisal service. If you’d like to discuss your appraisal needs in more details please contact us via the phone number on this site or the online contact form found above. 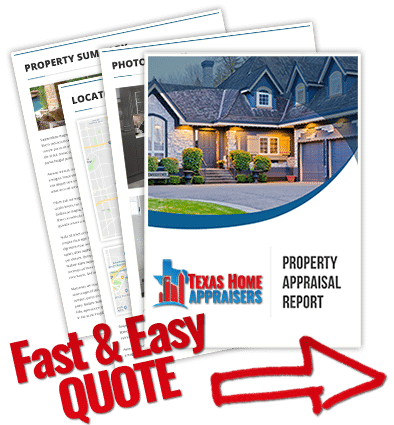 Do you need a local houston real estate appraiser fast? Give us a call or submit the online quote form and an appraiser help you right away. What types of information are used in an appraisal? The appraisal process is an orderly and concise method of reaching an estimate of value. The process has six major steps which include: definition of the problem, preliminary survey and appraisal plan, data collection and analysis, application of the three approaches to value, reconciliations of value indications, final estimate of defined value. The bulk of the appraisal is spent reviewing the three major approaches to value which include Market Data, Cost Approach and the Income approach. The three approaches are reconciled and the value via most applicable approach, in the opinion of the appraiser, is selected as the final estimate of value. In most instances, the market data approach is the best representation of buyer and seller influences in the market and relied upon heavily in residential appraisals. Do appraisers get on the roof? No. Appraisers are not required to walk the roof, though they will visually inspect it from the ground. If they believe that a roof may need additional review they will notate it on the appraisal report. The appraiser is required to list any possible issues they may see with the roof which could require a second inspection by a competent professional. What services do real estate appraisers provide? An appraiser’s function is to provide well researched and unbiased opinions of value for various types of properties. Appraisers can also serve as valuation consultants, expert witnesses, and insurance consultants and teachers. Does an appraiser look for certain things when doing an appraisal? An appraiser should determine the scope of work, follow through with an inspection, and provide an opinion of value to the client. Real property includes the physical land and appurtenances affixed to the land such as a underground pools, a built-in gazebo, boat docks, and outdoor kitchens. (MLS) Multiple listing service, local tax records, google maps, and other online data services help to support an appraiser during the appraisal process. To determine the gross living area of a home, an appraiser will typically take measurements from the outside first. This allows him to survey the exterior grounds and determine what is part of the gross living area. Once he has calculated the outside measurements, he will then come into the property to measure garage space and any second floor GLA. It’s imperative that an appraiser accurately measures and takes out any non-living areas to ensure that the GLA is correct.